Cash’n Guns – a circle of death! Last night we played a new game from Asmodee that is all kinds of fun. It recreates those great scenes in crime movies where the gangsters all sit around a table with guns in front of them and a big pile of money in the middle. In the game, you play bank robbers who are dividing up the loot from a heist. Each turn you point foam rubber guns at each other and decide whether you’re willing to shoot and/or be shot for the money that’s on the table. 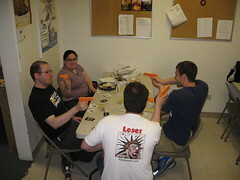 Later rounds introduce special skills and powers, and an undercover cop who’s secretly phoning for backup as the game goes on. The goal is to end up richer than anyone else and not dead. In that order.